Topical Corticosteroids are used directly on the skin. They are also known as topical steroids. They are totally different from anabolic steroids, normally used by some athletes and body-builders. These are illegal and can have some serious side effects. The steroids in eczema treatments effect the immune system. People who have eczema tend to have an over-active immune system. This causes inflammation and itchiness. The treatment reduces the system's activity, so reducing the symptoms. Topical steroids come in 4 strengths. The strength you use depends on the severity of your eczema. If a mild treatment is not effective, a moderate one may be tried. Though your doctor or specialist will recommend using the lowest strength that works. 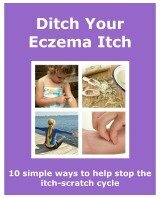 This could change depending on the condition of your eczema. The one negative thing you may hear about with regards to using topical corticosteroid treatment, is the side effects. Most side effects come from using stronger treatments over a long period of time. Anyone using stronger creams will be monitored by their doctor or specialist, so side effects are rare. There are guidelines to the use of topical corticosteroids. These include the advised amounts to use on certain areas of the body. I have always used topical corticosteroid treatments. Though only when I have needed to. I always have a tube of mild hydrocortisone in my bag. It doesn’t get used too often....well not until the weather changes and the central heating comes on! I am like anyone else with eczema. I succumb to the itch sometimes. I have had my fair share of infections over the years. I am normally prescribed Fucibet for it. Fucibet is a steroid cream combined with antibiotics. It is more than often my hands that get infected. I know the signs of an infection well now so I visit the doctor as soon as I notice it. I can get the treatment started as early as possible. It stops it spreading, so making it easier to treat with a cream. Another cream I have used is Eumovate. I used this when I needed a slightly stronger steroid. It is very handy to be able to buy this at the chemist. Though I recommend that you follow the pharmacist's directions of use. I tend to use Eumovate for a maximum of 7 days. If my eczema is being stubborn, then I visit my doctor. My eczema tends to be infected if a moderate steroid does not improve it. Even when using a topical corticosteroid I still use an emollient constantly. It helps to reduce the amount of hydrocortisone I use. It also helps reduce the itch so stops the scratching that promotes infection. I used to worry about the side effects. As I got older I looked into it. I found that a lot of older reports on topical steroids seem to be over exaggerated. I follow the guidelines of usage. As well as the directions from my doctor or the pharmacist. But I still wanted to find out as much I could for myself. I am very happy to use them now. They are a very important part of the treatment of my eczema. I just make sure I use them the right way.